It appeared that all 14 flavors of Spam were offered at the Safeway store in Kihei. The bottom shelf was selling out quickly yesterday in preparation for Thanksgiving which I believe was the original Spam flavor. Recently, we'd found that CBS Sunday Morning most current episode, a favorite TV show of our long ago past is shown at noon on Sundays on the Smithsonian channel. Spam flavored macadamia nuts we spotted in a visit to Lahaina. Most often, we're outside around noon but on a few occasions, we've made an effort to come back inside to watch the show while Í stand in the kitchen, able to see the TV while chopping and dicing for the next meal. Yesterday, a perfect day, we languished in swimming pool contemplating going inside to watch the show. After drying off, we returned to our condo 15 minutes after the show had started. Within five minutes after starting to watch the show, the story on Hawaii's love of Spam started. We chuckled over our good timing and the fact that this was only the second time we'd managed to catch the show. Also, we giggled over the fact that when we'd shopped at Costco in preparation for Hurricane Ana, we'd purchased eight cans of Spam in a single typical Costco over-sized package and Tom has since eaten all eight cans. I never took a bite although oddly, Spam is befitting my way of eating. Had we been stranded for weeks with no food, surely I'd have eaten some. In our cozy well equipped life here in Maui, I had no desire. Tom ate it cooked with eggs a few times. For the balance, he sliced it into thin pieces eating it with sliced cheese. Yesterday, during my last trip to the grocery store in Maui, I wandered over to the Spam aisle taking the above photo. I believe that the 14 varieties mentioned in the video were all represented but so many shoppers were clamoring to grab a can, I wasn't able to count. There is hardly a more maligned meat than Spam. But if you think Spam is just a culinary punch line, you haven't spent enough time in Hawaii. Known for their trade winds and rainbows, the Hawaiian Islands are also a Spam-a-alcoholic's paradise. In fact, no state eats more. On the island of Kauai, at the Foodland Waipouli that Orlando Dutdut manages, Spam is as plentiful as sun block. "It's a staple," said Dutdut. "Everybody eats it here." They sell 14 varieties of Spam. There's Spam with cheese, Spam with Garlic, with Turkey and Jalapeno . . . and nothing says "Aloha" quote like Spam-flavored Macadamia nuts. In fact, the taste of Spam is so popular in Hawaii you can even order it at McDonald's. Here, Spam and Eggs beats out the venerable Egg McMuffin, says McDonald's Ruth Johnson. "We call it Hawaiian prime rib, or Hawaiian roast beef," she laughed. Hawaii's love of all things Spam started during World War II. Millions of pounds of the stuff were shipped to GIs in the South Pacific, largely because it didn't spoil in the tropical sun. But when the serviceman left, the Spam stayed -- and it became part of the Island diet. 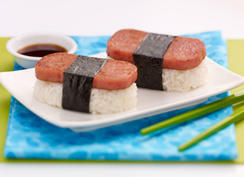 By far the favorite local dish is a Spam Musubi, which looks a bit like sushi. Robert Kubata's grandmother taught him how to make a Musubi the Island way. He bathes the Spam in teriyaki, and then places the pink rectangles between layers of sticky rice. After it's pressed together, it's all wrapped in seaweed. "It's like Asian culture, Western culture, everything was mixed up," said Kubata. "Put it all together, wrap it in nori, and here you go!" Spam has even entered the kitchens of the touristy restaurants, like Tiki Iniki in Princeville, where ordering the Spam Burger has become as daring as the owner's blue hairdo. 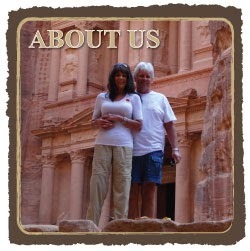 Cowan asked, "So what do the tourists think?" Michele Rundgren replied, "Most people say that's the best burger they've ever had. Or, 'Oh my God, it was good! It was amazing!'" "Well, the cocktails have a lot to do with it as well!" laughed her husband, music legend Todd Rundgren. (Remember, "Hello It's Me?") Mixing Spam with ground beef was his idea. Rungren says he wrote that -- and plenty of others -- while eating plenty of Spam. "He has been eating Spam since he was little," said Michele. "Really? It's no worse than a hot dog . . . " said Cowan. "No, it's way better than a hot dog!" said Todd. "It doesn't have any snouts or anuses in it!" "Dude! You can't say that on TV!" said Michele. The good folks at Hormel Foods -- an ocean away in chilly Austin, Minn. -- tell us Spam is mostly pork shoulder and salt, and not much else. Spam is cooked in its own can. They rattle through the plant at an astonishing pace. "We're running about 395 cans a minute," said Donnie Temperly, Vice President of Hormel's Grocery Products division. "So we've created a real Spam highway right here next to us!" Since its invention in 1937, Hormel has sold eight billion cans. But marketing the food with the quirky name has always been a curious challenge. At first, Spam was touted for its canned convenience, then for its versatility. Man: "Well, what've you got?" Waitress: "Well, there's egg and bacon; egg sausage and bacon; egg and spam; egg bacon and spam; egg bacon sausage and spam; spam bacon sausage and spam; spam egg spam spam bacon and spam; spam spam spam egg and spam; spam spam spam spam spam spam baked beans spam spam spam spam; or Lobster Thermidor aux Crevettes with a Mornay sauce garnished with truffle pate, brandy and a fried egg on top and spam." Wife: "Have you got anything without spam in it?" Waitress: "Well, there's spam egg sausage and spam -- that's not gotmuch spam in it!" In the end, Spam's marketing director Nicole Behne says Spam's kitsch may be its best selling tool. "People make up love songs about Spam," Behne said. "We have a fan who actually created a rocket out of Spam cans. People make musical instruments out of Spam. So there's a lot of fun that's had out there with our brand." Not that everything's funny. Hormel wasn't laughing when "Spam" officially entered the dictionary as a word to define unwanted emails. But Hormel's CEO Jeff Ettinger says the company realized that having a sense of humor about its flagship product was really the only way to go. "I think maybe our low moment with it was when we decided to sue the Muppets," Ettinger laughed. "There was a movie they put out that had a Spa'am character that was an evil character. I think that was kind of a turning point to say, you know, I guess we really need to be with the joke." This seemingly indestructible meat has been matched by its indestructible image. It's fed armies, helped America through recessions, and has endured as a true slice of Americana." To watch the "Spam" sketch from "Monty Python's Flying Circus," click here. We hope you enjoyed our Spam story. Back tomorrow with exciting new photos! On this date one year ago we dined at our favorite Sail's Restaurant in Diani Beach, Kenya after a bad dinner out the prior night. For details of that story, please click here. Tom, that same night with me at Sail's Restaurant in Diani Beach, Kenya.